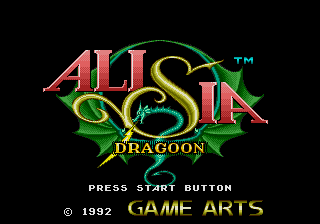 1 Preparation Before using any of the tricks for Alisia Dragoon you must do the following. First, turn on the game. When the word "SEGA" disappears, hold A. When "Produced by Game Arts" disappears, release A and hold B. When "Associated with GAIMAX" disappears, release B and hold C. When "Music Composed by Mecano Associates" disappears, release C and press START. You'll hear a bubbling musical sound if you've done this correctly. Now you can use any of the following tricks. 2 Slow Motion Press A on Controller Two for slow motion. Press B on Controller Two to resume normal speed. 3 Healing Press A on Controller Two, then hold UP on Controller One while pressing B on Controller Two. Alicia's hit point gauge will refill. 4 Increase Magic Press A on Controller Two, then hold LEFT on Controller One while pressing B on Controller Two. Alicia's thunder magic will increase one level. 5 Increase Companion's Abilities Press A on Controller Two, then hold RIGHT on Controller One while pressing B on Controller Two. This will increase the magic level and hit points of your current companion. 6 More Powerful Magic Press A on Controller Two, then hold B on Controller One while pressing B on Controller Two. The thunder magic becomes powerful enough to kill most enemies with a single blast. 7 Skip Level Press C on Controller Two to skip the current level. person is you - Alisa Dragoon. IMPRESSIONS:      One of many excellent Japanese-produced action games. Still, it ain't bad, it ain't bad at all. I think people should start paying more attention to this one. its really cool. especially all the forms the dragon can take and its fighting styles. its also got good graphics, that arent that bad at all. definatly try! 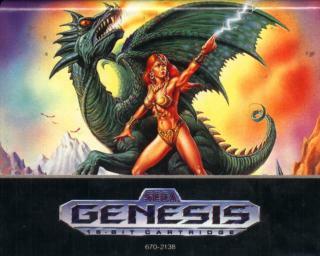 Great stuff for your Genesis ! 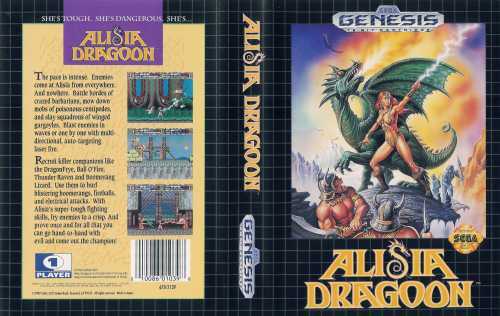 One of the few games in which the princess isn't sitting in some dungeon waiting to be rescued...instead, she goes out to avenge her father with her pet dragons and KICKS SOME @$$!!! Highly enjoyable! I just finally picked up this title a week ago. My first impression is simply WOW!!! The animation is great! 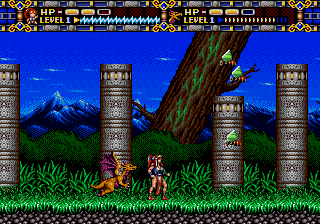 The morphing styles of the dragon companion is really cool and a wonderful strategy element added since some dragon morphs are better on some stages than others. Also the Music and sound in this game is simply supurb! I can now see why this title usually fetches the prices it does on Ebay! Highly worth picking up for your 16bit machine of goodness. this is a game for women! and you sir, are an sexistic fucktard.